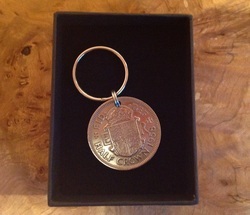 Our coin keyrings are most frequently made from half crowns and pennies. They are a great reminder of a birthday, anniversary or a special occasion. Our standard half crown and penny keyrings are £7.50 each and are presented in a black gift box. If you would like a keyring made from an alternative coin such as a shilling or halfpenny, we can advise you of the price on application. 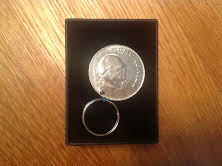 The Churchill Crown keyrings are solely dated 1965 and are also £7.50 each. Please contact us to discuss your specific coin requirements. 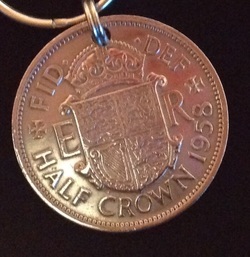 The date range for the half crown keyring is 1947 to 1967 inclusive. If you would like a half crown keyring with an earlier date, please contact us and we can advise you of the price on application. Otherwise known as the thrupenny bit, the beautiful brass threepence coin makes a bright and shiny addition to our keyring range. The date range for the threepence keyring is 1937 to 1967 with a note that the 1947 coin is not available as it was never minted and 1949 is rare. Please get in touch if you would like a particular date from this date range. This is one of the most majestic keyrings we have ever made. Made from a Churchill Crown and issued in 1965 only, it is big and commanding just like the statesman it portrays. The date range for the penny keyring is from Victorian times to 1967, depending on coin availability. The penny keyring features the figure of Britannia. Please contact us if you would like a penny keyring with a specific date. Fast Fact: The two Penny keyrings above feature King George V and his son King George VI. The former dated 1936 and the latter dated 1946. Normally when a monarch succeeds another, the heads change direction. However, in 1937, George VI succeeded to the throne after the death of his father and the abdication of his elder brother David, who was to be called Edward VIII. In deference to this fact, his portrait assumed the same position as his father as if there had been a monarch in between. A nice touch and unique in British coinage.